Mystery Babylon Watch: The Torch: Symbol of Lucifer "The Lightbearer"
The Torch: Symbol of Lucifer "The Lightbearer"
Mithras/Sol Invictus to the romans was born in December 25, a date which Catholicism claims Christ was born on, yet the bible does not hint at Jesus´s birthday to being December 25. Sol Invictus was also worshiped along with a winged lion headed figure called the Mithraic Aeon, Aeon was also known as Saturn. The cult of Mithras was very prevalent among Roman soldiers during the Roman Empire and hid their rituals in small hidden places called Mithraeums. The Colossus of Rhodes which was a statue of the Sun God Helios, the same as the Roman God, Sol Invictus, was destroyed in the Rhodes Earthquake in 226BC, with it´s Torch. On the left we can see the Baphomet depicted by occultist, Sabbatai Zevi, notice the torch on it´s head. 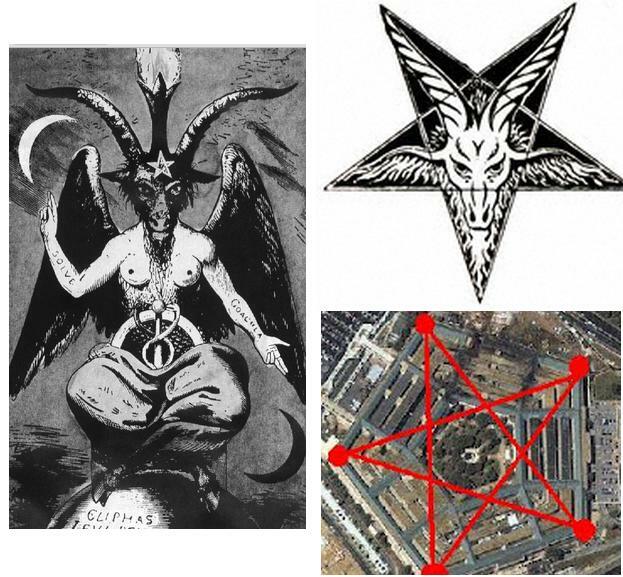 On the right we can see that the September Eleven attack on the Pentagon was done right on top where the head of Baphomet would be, lighting up the Torch part of the Goat´s head.